Before there were Travelifts, before there were marine railways, and even before drydocks, mariners concerned with performance used tidal grids for periodic maintenance. 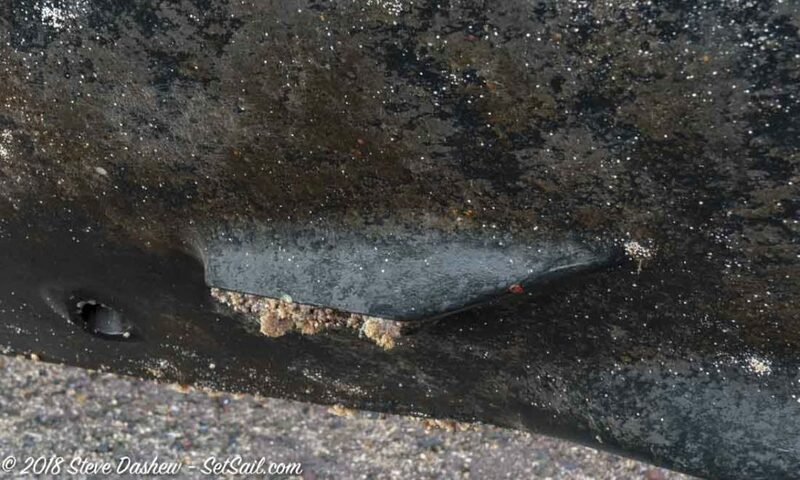 Judicious use of the rise and fall of mother nature’s tides provided a period in each cycle where the bottom of the vessel in question was dried out. The greater the tidal range, the longer time available for maintenance. We’ve used grids in both hemispheres over many years to keep our bottoms cleaned and our props polished. Whether it be the 30 ft tides of Darwin, Australia, or a mere 10-12 feet in the Bay of Islands, New Zealand, any tidal range that exceeds your draft by several feet will provide a working period. 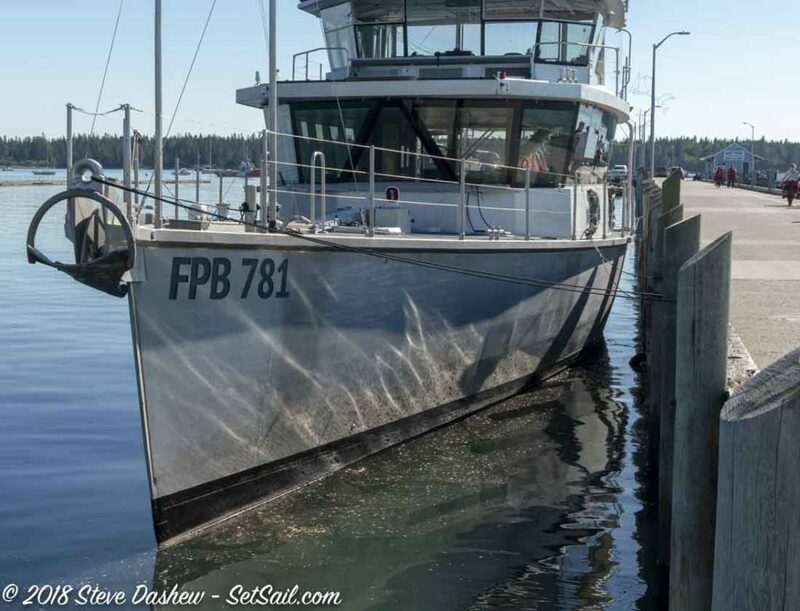 Many commercial vessels and some yachts, all FPBs included, are designed to dry out on their own in between tidal cycles. This comes in handy not only for maintenance, but for parking the boat in shallower regions. But for serious maintenance, a grid that supports the hull and prevents it from sinking into exposed ooze is essential. St. Andrews in New Brunswick, Canada, is a charming village with friendly people, a 20+ ft tidal range, and the most beautiful tidal grid we have ever seen. 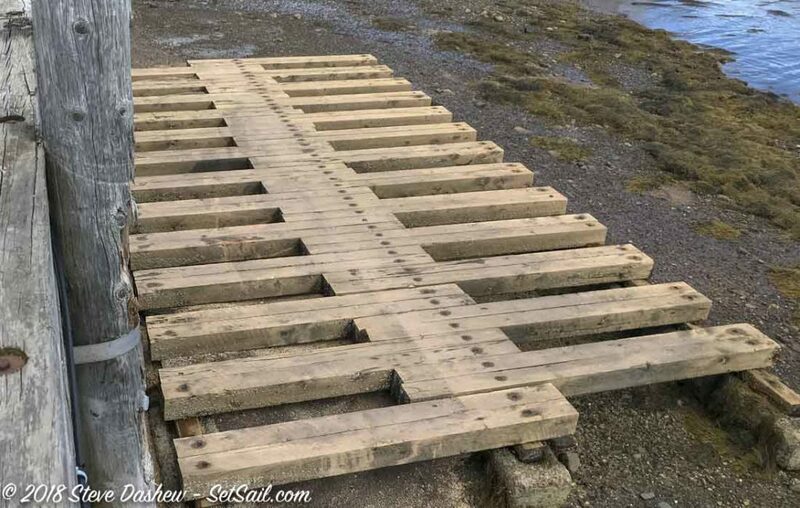 While a few posts driven into the mud will help support a dried-out vessel, when you have a stout pier and well constructed grid as exists here, it’s just too good to pass up. You may be surprised to see that there are no fenders between Cochise and the pilings in the photo above. 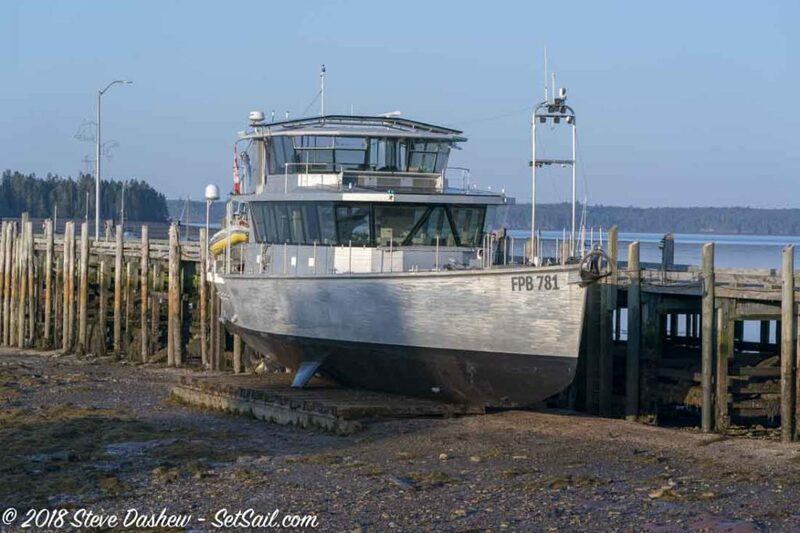 She is designed to lay on her own rub rail (keeping fenders in place can be a real hassle). 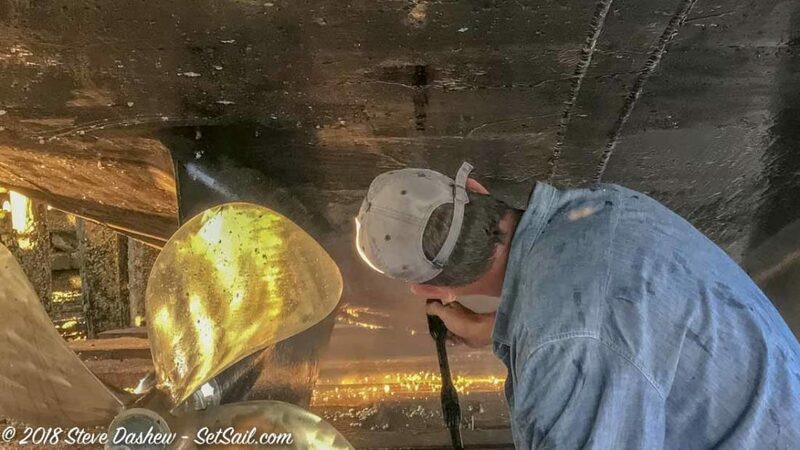 Intersleek 1100, the commercial-grade non-toxic bottom paint we have on FPB 78-1 Cochise, is designed for vessels that move all the time, or if parked for more than three weeks have routine bottom-wiping. Our cruising this summer represents the worst-case scenario for testing the Intersleek. We’ve spent most of the time anchored, traveling only a few miles between harbors, an ideal setup for the local sea creatures to hook on and take a ride with us. The two photos above illustrate the condition of our bottom. This was three months after her last clean. We were curious to see just how much work it would take to get the bottom really clean. The Black and Decker pressure washer in the foreground of this photo is the most compact model ($90 US) we’ve been able to find. Its primary job is cleaning the decks, with an occasional de-salting of glass and aluminum after a long passage. We did not expect this pressure washer to do much of a job on the bottom, and were pleasantly surprised to find that 2.5 hours of effort yielded a nearly pristine result. The propellers were polished using a battery-powered disc grinder with a Scotchbrite pad. With some local help and our own efforts, a total of 5 man hours were required to finish the whole job. You may have wondered why Cochise has ladders port and starboard just forward of the boarding gates. They work really well on grids and commercial docks. A couple comments about gridding in general: First, make sure that the subsequent tide after drying out is sufficiently high to get you off the grid. The deeper your draft the more critical this becomes. In our case, with only 5 feet of draft, we can float off with any tide. But with a deeper draft and less tidal range, if you can barely fit on the grid to begin with, you’re liable to get stuck there for a month. 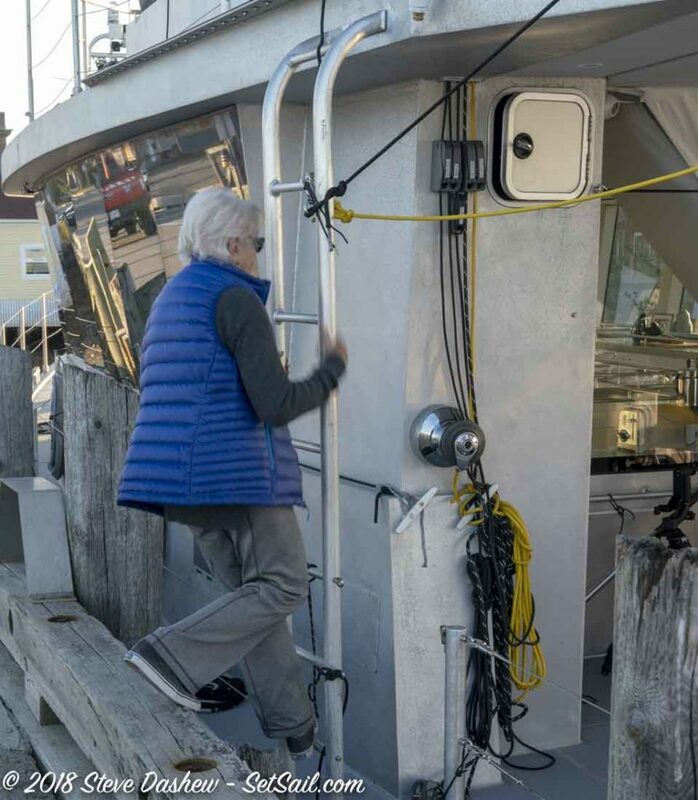 Second, if you have a sailboat and are sitting on your keel, make sure your boat is well-secured to the pilings alongside so it stays upright. 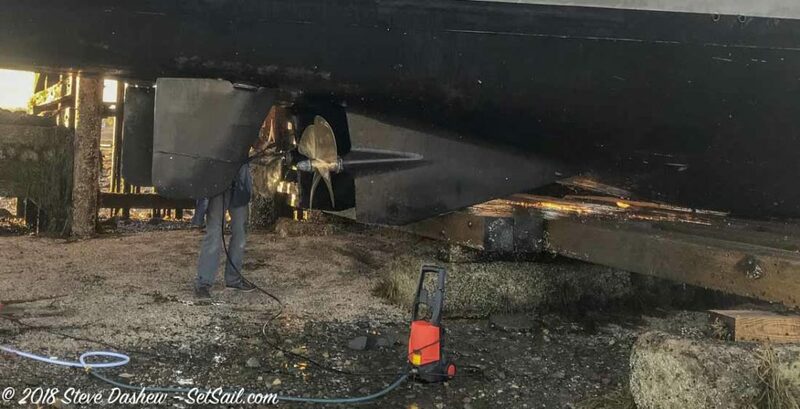 Lastly, if maintenance forces you to take a chance on the tidal range and you’re not 100% sure you can get off, set a kedge anchor so you can winch yourself back into deeper water if required. This entry was posted on Friday, October 19th, 2018 at 1:42 pm and is filed under Dashew Logs, FPB 78, The Logs. Both comments and pings are currently closed. Thanks for posting more interesting info about your exploits. I love reading it all. I was wondering why the trip back north. I second David’s comment – love reading it all. Great post and pic’s -and glad to read the work took less time with better result than expected. That bottom did look a little crusty. Will be interesting to see if you notice pickup in gph and speed. Just noticed those fins look very close the dry ground. are they designed to carry weight or are just not touching? The NAIAD stabilizer fins are attached to NAIAD’s 360 sized actuators. They tell us these are often used on 50 meter/165’ mega yachts. The fins themselves have an extra heavy steel armature custom made for us. So yes, these will take weight.